On a bone-chilling day in January, Jennifer Turpin visited a wheelchair-bound patient named Olivia Richard at her small apartment in Boston. Turpin, a care coordinator, was conducting a home inspection for Richard, who had just joined One Care, a state program for low-income, chronically ill people who are dually eligible for Medicare and Medicaid. Looking around the apartment, Turpin, who performs independent living assessments for the not-for-profit plan Commonwealth Care Alliance, was horrified at what she saw. Richard's sheets and dishes hadn't been washed in months, and her floor was black with dirt. Before she joined One Care, Richard did not receive consistent visits from home health aides. 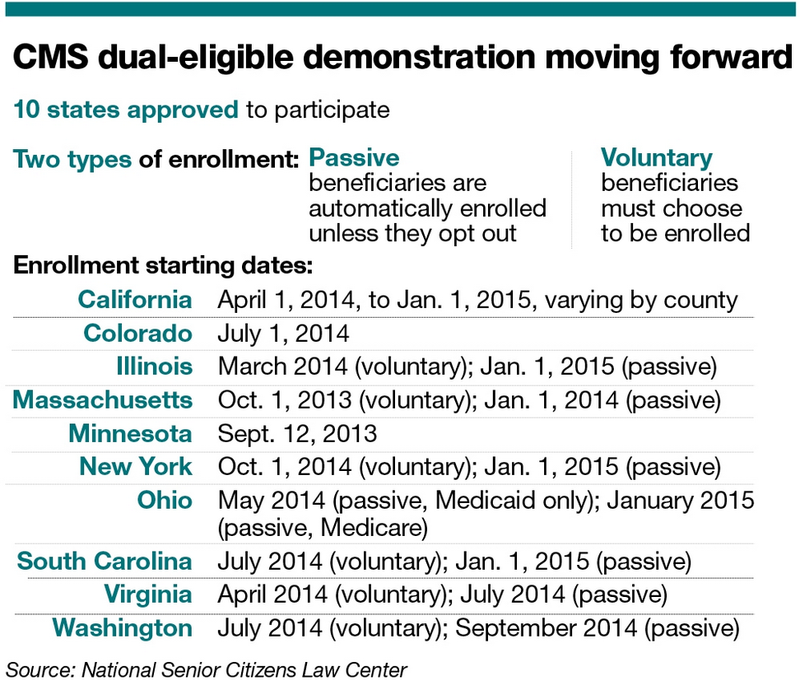 Since late last year, 10 states have launched or are about to launch dual-eligible initiatives under the CMS' Financial Alignment Initiative to improve care for more than 9 million dual-eligibles by integrating Medicaid and Medicare benefits. They hope better care coordination will reduce costs for this very expensive population, currently totaling about $350 billion a year. It's estimated that about 2 million are eligible for the program in those 10 states. But some experts question how many dual-eligible beneficiaries will voluntarily enroll in the newmanaged-care programs and whether private health plans participating in the demonstrations will get enough physicians and other providers to serve these challenging and time-consuming patients. In addition, there are questions about the quality of the plans themselves, and whether the demonstrations will produce cost savings. While most dual-eligibles are 65 or older, around 40% are younger. Many duals under age 65 have multiple chronic health conditions, including mental-health and substance-abuse issues, or physical or developmental disabilities. Some are homeless, while others live in residential care facilities. Often the healthcare and other support services that they receive are fragmented because duals fall through the cracks of the two programs. Many duals need home- and community-based support in addition to medical and behavioral care. While 26 states applied to participate, so far only California, Colorado, Illinois, Massachusetts, Minnesota, New York, Ohio, South Carolina, Virginia and Washington have received federal approval to start their programs. Massachusetts and Minnesota are the farthest along, having launched their programs last year. Illinois began enrollment in March, and the rest of the states are starting enrollment between April and October. Some states are targeting all their duals, while others are focusing on a subset, such as those under 65 or those needing long-term care. To continue reading this Modern Healthcare article, please click here. And to learn more about dual eligibles please join us at the 22nd Annual Medicaid Managed Care Congress, May 19-21 in Baltimore, MD.